Where Have All the Playgrounds Gone? 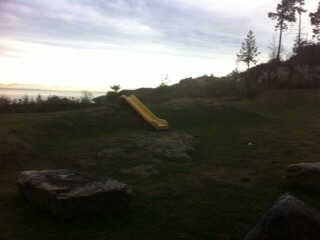 I was driving around Sechelt last week and noticed that there seemed to be a lack of playground spaces for young children. We have playgrounds at the elementary schools, soccer fields and ball diamonds, but when it comes to the newest subdivisions in the Sechelt area, there are no ‘real’ playgrounds, especially in quickly expanding West Sechelt. There are a few ‘green areas’ in the West Sechelt area — Tyler Heights Park and Clayton Park, but as you can see from my photos below, the playground equipment is unimpressive. Picadilly Park is much more family friendly, but is still located quite a distance from these other two areas. And if you want to drive, you can certainly try Trail Bay Waterfront, Pier and Adventure Park or Porpoise Bay Provincial Park. I will say that the views from both of these parks is amazing, but the terrain not especially friendly for young families. Tyler Heights is especially difficult, having been built up on a rock boasting in blackberry brambles. There is green grass at Clayton Park which I’m sure is lovely to roll around in after you’ve used the equipment there – a short slide. One positive thing is that both of these playgrounds are very close to the trail system that snakes through the West Sechelt area. And the view is stellar. But c’mon… the play structures are abysmal. The Sunshine Coast community is trying to attract more families and young people, yet our neighbourhoods lack the subliminal message that children are present or even welcome. 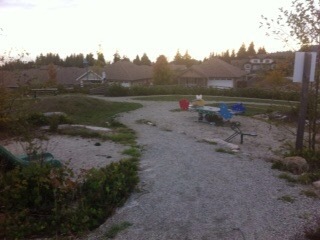 And yes, you could argue that these new subdivisions are not being marketed to families with young children. But those luxury homes can be sold to young professional couples that wish to make a lifestyle change to the coast or they can be sold to grandparents. And don’t we already have enough luxury homes sitting empty on the coast? The launch of the Vital Signs Report earlier this week (see full report here http://sccfoundation.com/vitalsigns/ ) shows the aging demographic of our population is continuing to grow as the population under age 45 continues to decrease. In 2010, 40.9% of the Sunshine Coast population was under 45. In 2013, that number was 38.6%. No, this is not the fault of subpar playgrounds. But I would place blame in how each aspect of our community markets and brands ourselves to the world. Take a look around your neighbourhood with new eyes. What attracts you to live there? Is there a place for your children to play? What keeps you here? Is it your job, quality of life, the environment? What would it take to bring your friends here from off-coast? As we enter the 2014 Municipal Election arena, listen to the candidates carefully as they address the issues brought forth to them. And make sure that you ask your questions. November 15th comes quickly; make sure you have your voice heard. I haven’t been able to wrap my head around that Christmas is almost here. We are a week out, and I have no decorations up, the tree hasn’t even made it to my home. I have baked some Christmas goodies, and given them away, so I guess that counts. But my heart is still not embracing the spirit of the season. And then I had a reminder from my daughter Kim this morning. I pulled up the blinds and found a collection of window decorations she painted recently. I thought she had taken them to school, but she left them here for me to enjoy. I love how my daughters do these little things that remind me to stop and enjoy the moment.